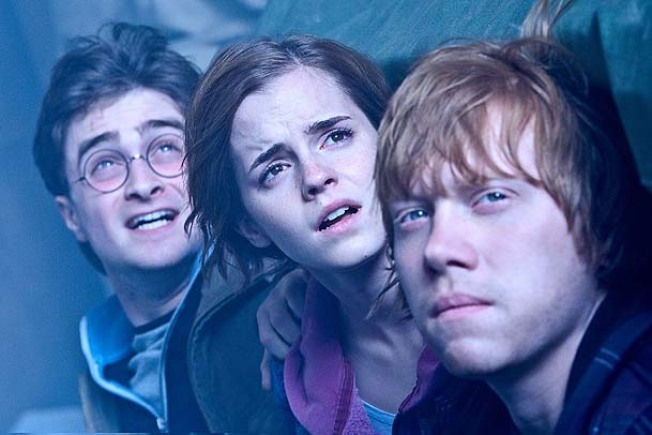 (L-r) DANIEL RADCLIFFE as Harry Potter, EMMA WATSON as Hermione Granger and RUPERT GRINT as Ron Weasley in Warner Bros. Pictures’ fantasy adventure “HARRY POTTER AND THE DEATHLY HALLOWS – PART 2,” a Warner Bros. Pictures release. "Harry Potter and the Deathly Hallows Part 2" finished its opening weekend with the biggest box office debut in Hollywood history. Grossing an estimated $168.6 million at the box office between Friday and Sunday, the final film in the Harry Potter franchise bested the previous opening weekend box office record, held by the 2007 Batman epic "The Dark Knight." On its opening day, the Potter finale made $92.1 million—more than any other movie ever had on its opening day or a single day. "The Twilight Saga: New Moon" had previously topped the opening day list with a $72.7 million opening. "Deathly Hallows" also demolished a handful of other box office records in the process. Its midnight screenings made more than any other movie's with $43.5 million, and its IMAX opening did, too, with $15.5 million. The movie managed to rake it in nationwide—even in Los Angeles, where a weekend shutdown of Interstate 405 known as Carmageddon threatened to dampen ticket sales. "The two major cinemas most directly affected… both did outstanding business," said Warner Bros. executive Dan Fellman. The movie's financial momentum reflected the enormous popularity of the Harry Potter franchise on and off the screen. British writer J.K. Rowling, who penned the best-selling books on which the films were based, became the world's first billionaire author with the series over seven years ago. It also reflected widespread critical acclaim for the movie, which won accolades for being what The New York Times called "deeply satisfying."